Somehow very few people know of Oakland’s Secret Rose Garden hidden in a residential neighborhood off of Grand Avenue on Jean Street. 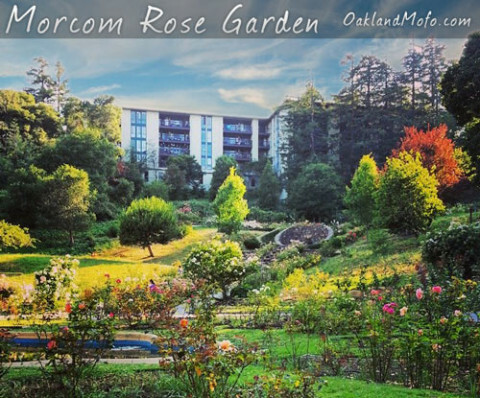 Morcom Rose Garden, also known as the Morcom Amphitheater of Roses is a great little secret park. If you like running the Cleavland Cascade but find it’s suddenly gotten too crowded the last few years, migrate east to the Rose Garden and ruin someone else’s secret exercise location. The Morcom Rose Garden and amphitheater is a very cute hidden garden with stairs, a pond, fountain, bathrooms, roses and such. It is a nice quite park to run, read, feed the animals or nap in. It is also a little animal sanctuary in the Grand Lake neighborhood with a plethora of squirrels and small birds hopping around. They are known to beg for a piece of your scone while you sip your coffee. But not only will you see small birds and squirrels, you may see Blue Jays, Hawks and Racoons in this natural habitat of peace. In 1933 Oakland’s Mayor Fred Morcom planted the first rose and in 1980 it was dedicated as an Oakland Historical Landmark. To this date weddings and other small events can be held there if you obtain a permit through the City of Oakland. Dog Free Park but there are no signs saying no dogs.